Beagle 2: "High risk, high return science"
The British-built Mars lander, Beagle 2, is about to leave home on the first leg of its journey to the Red Planet. It will be shipped to southern France to join the European Space Agency's Mars Express spacecraft. Beagle, named after the ship on which Darwin sailed to the Galapagos Islands, will hitch a lift into space this summer. The main spacecraft and the lander are set to take off from the Russian spaceport at Baikonur in May or June. The delivery of Beagle marks another milestone in what has already been a rollercoaster ride for scientists and engineers. The project has faced budgetary problems, technical challenges and delays; relying on innovation, goodwill and sheer hard graft to survive. Although the day of despatch will be a triumph of the human spirit for Colin Pillinger of the Open University and his team, it is only the start of the rocky road to Mars. Professor Pillinger must now secure multi-million-pound sponsorship deals to pay back loans pledged to get the spacecraft built. He told BBC News Online last week: "I still have to sell this mission to the highest bidder to pay back the people who've invested and that is not an insignificant job." Beagle is unlike any space project that has gone before in that it relies on a hotch-potch of funding from government agencies and industry. Professor Pillinger refuses to reveal the total cost of the venture and even who has made contributions. He says people who put money in are protected by a "secret agreement" and to discuss funding would break their confidence. Answers have been hard to find, particularly from industry which has given some of its services for free. But figures obtained by BBC News Online suggest the budget exceeds £30m, much of which has to be repaid. The European Space Agency (Esa) says its science programme committee has approved an amount not to exceed £16m (24m euros), two-thirds of which is a loan to be repaid in the future. The Department of Trade and Industry (DTI) has provided £5m (8m euros) and more UK Government money - about £6m (10m euros) - has been channelled in through the Particle Physics and Astronomy Research Council (PParc). Other backers include European space company Astrium, which has not revealed its share; the Wellcome Trust, which has donated £2.6m (4m euros) for scientific equipment; and the Open University itself. So why the secrecy? One reason is the need for sponsorship. Space, as recent events have shown, is a very risky business. There are few commercial enterprises willing to gamble money on a launch and indeed a Mars landing. Overall, about two in three Mars missions have failed, so there is a good chance Beagle may never make it to the Martian surface. "Beagle is high risk, high return science," says Sue Horne, head of the solar system and space science group at PParc. "If we get a positive result on Beagle, it will be an incredible science breakthrough. But there are a lot of risks." She says sponsorship deals are being discussed at the moment but it is "confidential information". "The DTI and Esa have underwritten the mission, so that it could go ahead, and if sponsorship comes it will balance the money that has been put in by the DTI, the Open University, Esa and anyone else," she told BBC News Online. PParc concedes that it will be easier to secure sponsorship once the spacecraft is at Mars. Massive press coverage is bound to tempt commercial backers and there will be opportunities for branding educational packs and other spin-offs. 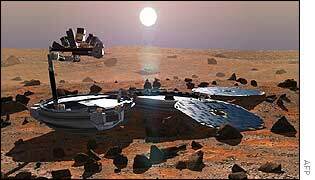 When they come to write the history of Mars, there may be a small chapter reserved for Beagle 2. If all goes well, the probe, about the size of a washing machine and weighing only 60 kilograms, will parachute on to the Martian surface. It should land somewhere near the boundary between the ancient highlands and the northern plains at the beginning of springtime. As the main spacecraft orbits above, Beagle will burrow a robotic probe into the red soil, and analyse rocks for signs that water, and life, may once have existed there. Finding traces of life on the Red Planet would be one of the most remarkable events in history. It would be vindication, too, for Professor Pillinger, who has been lobbying for funds for the project since 1997. "Mars has fascinated people since 5 or 6,000 years ago when they first noticed there was a strange red object in the sky that went backwards and forwards," he says. "We are the generation that has a chance to do something different." "It's taken five years to build"